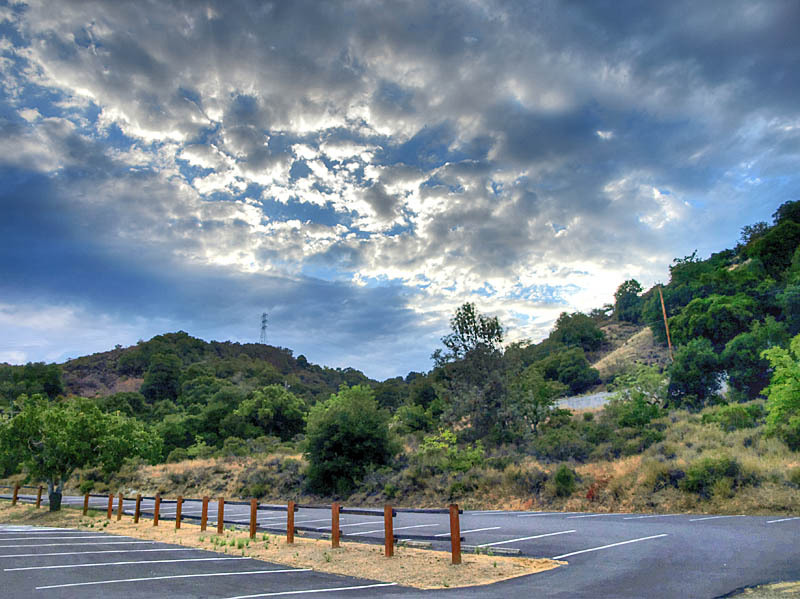 1042-acre Stevens Creek County Park is located in the hills above Cupertino, surrounding 92-acre Stevens Creek Reservoir. The County Parks' Healthy Trails Challenge, Third Edition, has a 1-mile trail route in the park. (See the link on the left for more on the Healthy Trails program.) Here are the Trail Directions, from the Healthy Trails guide. Here are pictures, taken 8/4/12, showing this trail route. The trail begins at the end of the parking lot for the Chestnut Picnic Area. The Rim Trail begins at the northernmost tip of the park and heads up the hill to the left. Here, the Rim Trail is a wide, graded service road running just below Stevens Canyon Road. There's a rock-lined culvert above the trail. The culvert below the trail is lined with poison oak. Oak trees provide some shade. The trail crosses the park road. The trail begins again on the other side of the road. It's a very wide service road. Next to the trail are the old building foundations. The trail reaches the Y-junction mentioned in the instructions. Take the trail leading downhill on the left. The trail approaches a shady section. The trail levels out at the bottom of this ravine, which is covered with blackberry vines. There's an old green building down the ravine. The trail climbs up to a T-junction. It's not mentioned in the trail directions, but at this junction ahead, make a right turn. If you turn left, you'll end up passing a private residence. This is a view looking back down the trail as it comes up to join the T-junction. This is the main trail, a wide, dirt service road. The trail here is mostly sunny, but there is this oak tree, providing shade. The trail drops down through this shady swale. As the trail rises back up, you can see the dam of Stevens Creek Reservoir. Ahead, the trail reaches a junction. The Healthy Trails route turns to the left. The Rim Trail continues straight ahead. The trail here is a paved service road. To the right, it leads towards the dam. If you take the trail to the right, it leads to the trail entrance on Stevens Canyon Road. The Rim Trail continues on the left. It leads down below the dam and reaches the Tony Look Trail on the other side of the dam. Back at the trail junction, take the paved trail leading downhill (right). This is the straight section of paved trail, leading gradually downhill. This is the gate at the end of the paved trail. Ahead is the park road and the bridge over Stevens Creek. On the left after the trail gate is a road leading to a private residence, probably a park employee's house. If you accidentally took the wrong trail as mentioned previously, you would pass near the residence and come out here. This is Stevens Creek flowing under the park road bridge. The Bay Tree Picnic Area is here, which has picnic tables, BBQ pits, a restroom, and water. The Healthy Trails route follows the park road. This is the park road bridge over Stevens Creek. On the other side of the bridge is the entrance to the Tony Look Trail, which leads to much longer and strenuous trails. They join up with the trails in neighboring Fremont Older Open Space Preserve. Approaching the park offce, a deer crosses the park road. This is the park office, where you can get water, maps, and information. After the ranger station is an entrance to trails leading to the Chestnut and Villa Maria picnic areas. The park road crosses over an old concrete bridge over Stevens Creek. This is Stevens Creek upstream of the bridge. This is Stevens Creek downstream from the bridge. Right after the bridge is the entrance to the Rim Trail next to the remnants of an old orchard. The trail leads back to the parking lot. This is the end of the loop, back at the trail start. End of the tday at the Chestnut Picnic Area Parking Lot (HDR picture).